This cake is very simple yet a very moist and pleasant dessert. 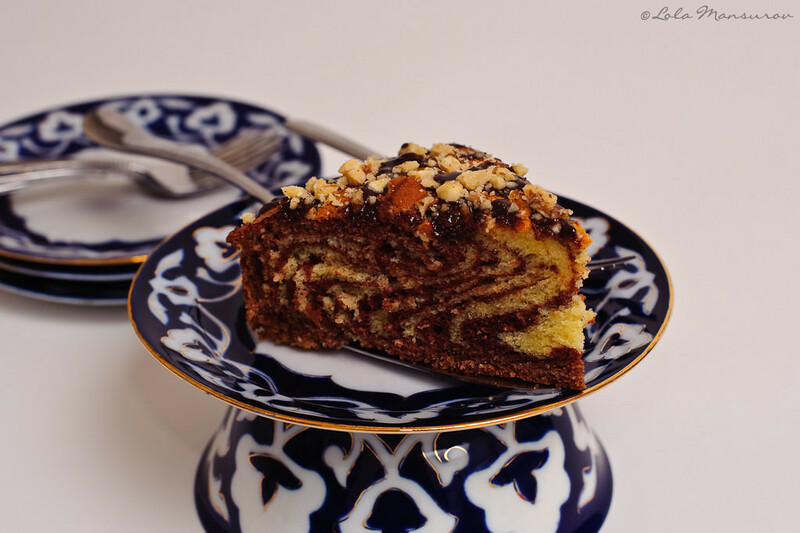 I have tried different recipes to find an ideal marble cake. This is the best recipe for me so far. Try it out! In a medium bowl beat the eggs with sugar for about 5 minutes. Add melted butter and sour cream. Add the flour, salt and baking soda and keep on beating in medium speed of your mixer. Pour half of the batter into different bowl. Add cocoa powder to one of the batters leaving the other one the color it is. To create the perfect marble effect you will need to use two big spoons dedicated to each batter. Start from the center of the pan, put one spoon of white batter and follow it up with the cocoa batter, so on and so forth. Time to time slightly shake the pan to make sure batter lays evenly throughout the pan. Preheat oven at 350F and bake the cake for 40 minutes. You can decorate it the way you like or you can simple leave it as it is. 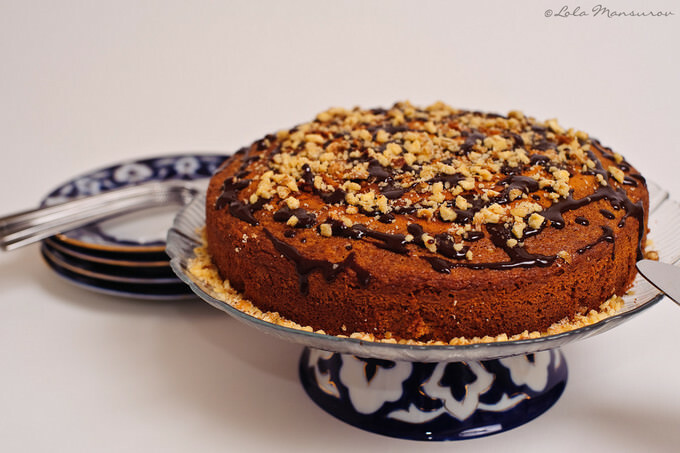 I like glazing it with Ganache and sprinkling ground walnuts on top. Hilola, really loved the cake. I am very much into baking myself, but couldn’t quite get the idea behind the spoon technique. I am guessing you are saying to spoon two colored batters into a pan one spoon at a time mixing the colors? R u supposed to make those wavy moves with the spoons as well or just let it sink in? Put a spoon full of white batter on the center of the baking pan and let it spread slightly on its own. Put one spoon full of cocoa batter in the center of the white(on the pan). It will push out the other batter. Keep alternating white with cocoa batter until you finish both of them. Like I said in the recipe, I shake the pan time to time to make sure batter spreads nicely. I made this cake for some friends of mine, Dan and Doug, they’re twins, today is their birthday. I doubled the recipe and added a bit of vanilla to the yellow mix, and instead of cocoa I melted 4 squares of bittersweet chocolate for the chocolate batter, then did a normal marbling in a 9×13 pan since I don’t have any round cake pans. I knew it was going to be amazing, it was the best cake batter I’ve ever tasted haha! I was really worried while I was baking it and almost got angry while I was baking it, I used a new air bake pan and one side was totally done, and the other was most certainly not, so I thought one side would be really dry and the other side would be nothing but batter, but after a rotation and a few more minutes so the gooey side would finish, I pulled it out and put the lid on loosely to trap some moisture. I made bittersweet chocolate ganache, and brought it to them this morning. and Doug said it was “fire” and that he’d never had a cake so good. Thank you SOOOO much for posting this recipe, I’ll be using it many more times in the future! Hahahahaha, oh Shelly!! You cracked me up so bad I couldn’t stop laughing for a while! I am really glad you liked the recipe. I will post the step-by-step recipe soon. how do i get sour cream? You can buy sour cream in any major grocery store (maybe small ones, too). It is sold along side with other milk products. The most popular would be Daisy. Landolakes makes nice sour cream, too. I made this for my son’s birthday cake and it was amazing. Thanks! hi, you used melted butter instead of soften? may i know why? i thought beating sugar with soften butter will make the cake rise bettera nd smoother? The cake needed more sweetness and I also added vanilla essence. Rest was good. May I know what type of vinegar do u mix with the baking soda? And when u say melted butter, is that mean when the butter gets watery? What is 1,5 cup of flour? Do you mean 1 cup or 1 1/2 cup or 1/2 cup? I love this cake……..I did it the same excat thing and itcame out sooooo good. this is the best marble cake ever! Instead of cocoa powder I melt real chocolate, yum! I make this cake every week. super easy to make. I’m not even that great of a backer! and everyone who tastes it raves about it. It’s not too sweet, it’s just perfect! I’ve never baked a cake with vinegar or sour cream in it before! The reviews seem pretty great though so I’ll trust ya. I’m baking my boyfriend a cake tomorrow and I remember him mentioning that marble is his favorite. I’ve never attempted marble before so I hope this turns out well! Thanks for the recipe!! Its th first ever time i baked and it was a simple and brilliant recipe. Thanks a ton! Your cake is in the oven baking.. be back to tell you how it rates :) i used ghiardelli bittersweet melted chocolate and a little cocoa powder. Can you please explain the 1,5 cups of flour ? Do you mean 1.5 or 1 and 1/2 cups of flour?? Thank you, can’t wait to try this ! Linda, so sorry for confuse you. 1,5 by my measuring is 1 and 1/2 cups. Will fix the article. Thank you for the cake recipe! It turned out very tasty! I wonder if you know where I can find the russian text of this cake recipe, what website to look at?